Two days ago I was able to install a package of bees which were purchased from Ruhl Bee Supply into a Warre Beehive which I had assembled. The bees were surprisingly calm, considering they had just made a long trip from Southern California. After I readied the beehive by rubbing the inside with beeswax, I set it up on a steady hive stand made of 4×4’s and 2″ lumber. Then, I sprayed the bees with a spray bottle containing a mixture of sugar and water in order to make sure they remained completely calm. I removed four top bars of the first hive box, and opened the package of bees. I took out the Queen Cage and removed the cork plug which keeps her inside. I shoved a marshmallow candy into the end and placed the cage on the floor of the hive towards the back. The bees will release the Queen in their own time by eating the candy at their own pace. I took the package and inverted it over the hive box and shook the bees over the Queen Cage. A couple of taps on the end of the package loosened the grip of the remaining bees and I helped them into the hive with their sisters. I placed the empty cage on the ground leaning against the entrance of the hive so that any bees left in the package could find their way into the hive. I placed the cloth, quilt and roof on the hive box after replacing the top bars I had removed. I placed some honey in a feeder dish nearby and then stood back to watch the new hive. Within 5 minutes, the sentinel bees had started to fan at the entrance of the hive. They were emitting a scent to draw in any bees that had become separated from the main cluster during the hiving process. After I was finished, I realized that this package installation was the fastest I have ever done, mainly due to the ease of use of the Warre Hive. It pays to use good equipment…especially when you are keeping bees. 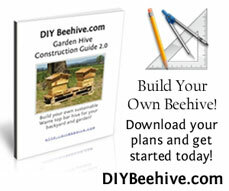 This entry was posted in Beekeeping Advice, Warre Hive and tagged beekeeping, HowTo, installing package bees, new beehive, Top Bar Hive. Bookmark the permalink.